Today marks 46 years since the U.S. Supreme Court legalized abortion-on-demand through all nine months of pregnancy. Every year, prolife people gather in Washington, D.C., to protest the Court’s decisions in Roe v. Wade and Doe v. Bolton. The national March for Life also brings attention to the lives lost to abortion. Since 1973 there have been an estimated 59 million abortions. Prolife people are used to scant or slanted media coverage of the March for Life. However, this year the media and our national discourse crossed a bright red line. Very few Michigan media publications covered the March for Life in-depth. 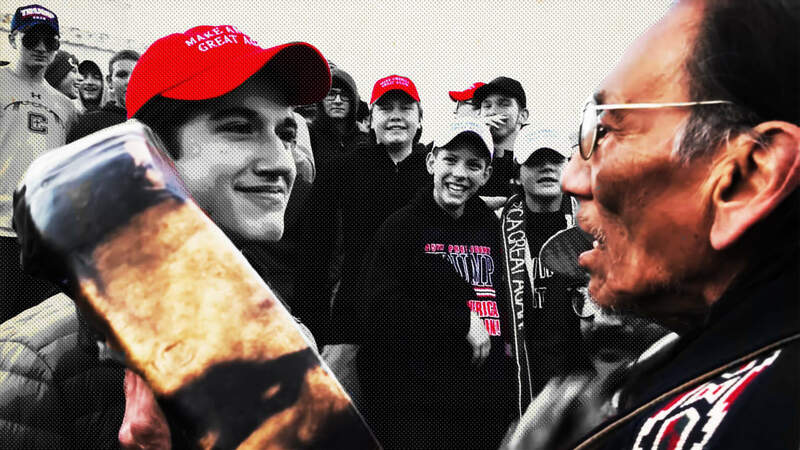 That all changed with a short online video appearing to show a student at Covington Catholic High School in Kentucky, Nicholas Sandmann, staring down an older Native American man from Michigan playing a drum, Nathan Phillips. That story got a lot of attention. Additional video evidence has shown that the story and Phillips’s account don’t align with the facts. The students were waiting for their bus to pick them up, not seeking out the Native Americans to harass them. Several adults were heckling the students with racist and anti-gay slurs before Phillips arrived. The students showed restraint, eventually trying to sing school fight songs to drown out the hate directed at them. Phillips was not surrounded by a mob, he purposefully approached the group of students. When Phillip’s group approached with their drums, the students began dancing to their beats, not mocking them. Zero videos of the event have captured anyone chanting, “build the wall.” Phillips did not come to de-escalate the situation, he stared down Sandmann—banging a drum directly in his face—while at least one member of Phillips’ group antagonized the kids. Video has captured Sandmann moving to de-escalate an argument between one of his fellow students and a member of Phillips’ group. Almost everything that everyone read about the March for Life and this situation was at best gravely wrong, at worst a cynical lie to hold up a teen as a scapegoat. The media has enabled those false statements. The episode should remind everyone of how the Planned Parenthood organ trafficking videos were handled. Even though full footage and transcripts were released alongside the featured undercover videos, many media outlets uncritically repeated Planned Parenthood talking points that the videos were deceptively edited. In the case of the Covington kids, the media mostly all ran with deceptively-edited videos without waiting for any background information. The rush to judgement on the part of the media was a violation of their basic professional ethics. Sandmann is arguably a private figure and a minor. The media ran with an account containing false information without giving Sandmann or anyone a chance to tell their side of the story. Reporters began trying to track down his personal information to expose him to the online mob. The online mob found a person who wasn’t Sandmann, and that person began receiving death threats. A CNN contributor and other members of the media expressed fantasies of committing violence against Sandmann, a minor. Sandmann has since released a statement that lines up with the video evidence available, which contradicts several key points of Phillip’s account. Something has to change. People must be held accountable, especially those wishing to commit violence against a teen like former CNN contributor Reza Aslan, who continued reporting about an entirely unproven charge of “build the wall” chants. Why was a story riddled with false information the only thing most people heard about the March for Life? Why did a non-violent confrontation that happens in similar ways numerous times at political events in America make national news? Because it fit the prejudices of most media outlets. Sandmann was wearing a Make America Great Again baseball hat. The “deceptively edited” video captured by Phillips’ group was a perfect vehicle to confirm every prior bad assumption many have about prolife people or Trump supporters in general. In their lust to score web traffic or political points, many media outlets set about destroying the life of a minor they’ve never met and didn’t care to hear from. President Donald Trump routinely antagonizes the press as spreading “fake news,” and has even called the press the “enemy of the people.” While certainly hyperbolic, imagine it from the perspective of prolife individuals. For years, legalized abortion has been protected by the media. Roe v. Wade is often characterized as a limited decision, and Doe v. Bolton is never mentioned. Most Americans don’t know the basic facts of the abortion issue. The March for Life is routinely slighted in what can only be described as a purposeful manner. Crowds of hundreds of thousands are labeled mere “thousands.” Misleading pictures of people gathered at the side of the March for Life—pictures that no skilled photographer would be proud of—are used instead of shots of the impressive crowd. Prolife people have seen this for 46 years. When President Trump calls the media the “enemy of the people,” many prolife people nod their heads. Their cynicism is confirmed on a routine basis. This ongoing hit-job on a teen whose only crime is standing while an adult bangs a drum in his face is yet another example making it hard for us to reassure prolife people that the media isn’t their enemy. Many prolife people send their children to the March for Life. Next year, parents will have to decide if sending their child is worth the danger of having reporters threaten violence against their child as they work to systematically spread false information to destroy their child’s future. It doesn’t matter how much they prepare their children for dealing with protestors, something as simple as awkwardly standing in place is enough to incite a mob. A media claiming the mantle of the First Amendment is chilling the very ability of young people to gather peacefully and express their free speech rights without fear of reckless and irresponsible retaliation. Something must change. On Monday, Right to Life of Michigan contacted several Michigan media sources that ran with the false story and asked for explanations, apologies, follow-up stories—anything to restore at least some modicum of respect for journalism as a profession. The few that have responded so far have blamed the national media for getting the story wrong, even though they ran those flawed stories attacking children. Those that responded expressed zero sympathy for the death threats these kids have received. None showed any awareness of how far over the line they’ve crossed. There are some outlets that put in real effort to cover the March for Life. They are to be commended for following their journalistic ethics and desiring to be fair. However, they are the exception. Prolife people in the future must change as well. Even people who’ve been to the March for Life itself and understand the incredibly peaceful nature of the event joined in the crowd to denounce Sandmann and the Covington kids before the facts of the story were known. Moving forward, prolife people should adopt a 24-hour rule. Please wait a day for genuine reporting to occur before believing what you read. Mainstream media outlets can not be trusted to follow their own professional ethical rules, including treatment of private figures, collecting full details from sources, or giving the subjects of their hit pieces a real opportunity to respond. 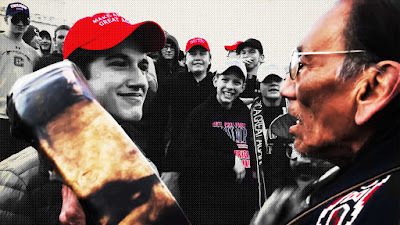 The Covington kids are the latest in a long train of outrageous incidents. Mistakes happen and people get stories wrong, but why are the mistakes always slanted in favor of abortion? Why does Planned Parenthood always get favorable coverage of their false talking points? Why was America’s most prolific serial killer, Kermit Gosnell, dismissed as a local crime story unworthy of mention? Why do instances of prolife people being verbally abused, harassed, or mocked never turn into the outrage of the day on social media? For many prolife people, this was the last straw. We have heard their messages to us and understand their frustration. Right to Life of Michigan will always work to apply standards that journalists fail to apply to themselves, though of course we will stand for our beliefs. We will honestly try to give the full details about stories. We would not single out pro-abortion teens at events as avatars of our rage and seek to destroy their lives. If prolife people misbehave, Right to Life of Michigan will call it out. Our policy is always to follow the law. We’ve gone as far as running TV ads in the past to call for peace and respect for civil discourse. When journalists choose to ignore their own professional ethics, we will call it out as well. We will continue to do their job for them, giving you in-depth information and background details for free. If our civil discourse has any chance to recover, the media needs to adopt changes that show they are serious about treating the abortion issue fairly. This goes beyond half-hearted corrections to get out in front of potential libel lawsuits. Half the country is prolife and they are not going to subscribe or provide advertising revenue to publications treating them as an enemy to be destroyed. Most prolife people believe that if the media was 50/50 fair with news coverage of abortion, we would have made many more significant gains. In spite of biased coverage and major political and cultural institutions set against us, we continue to change hearts and minds, increase legal protections, and abortion rates continue declining. How many more lives would have been saved if the American people were given a free choice to look at the issue and decide for themselves? Since 1973, 59 million human beings have had their lives erased by abortion. Each life lost is a tragedy. The catastrophe of abortion—the leading cause of death in America if counted—should be treated as better than a side issue. Every year, we’ll continue to highlight the March for Life, the egregious abuses of power in Roe v. Wade and Doe v. Bolton, and the real human lives lost. We’ll keep doing it—even if we’re the only ones doing it—until one year we don’t have to anymore.